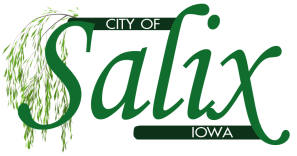 Hello, Welcome to the official website for the City of Salix, Iowa. Salix, like other towns, is built on our history. But our foundations lie in our local businesses, our churches, our renewed outlook for economic growth... and our residents. Geographically we are situated ideally between nearby opportunities in agribusiness, industry, retailing and recreation, friendly neighbors and the joy of living in a small community. Salix is located on Interstate 29. Brown's Lake/Bigelow County Park and Snyder Bend County Park are nearby. Camping, hiking, hunting and fishing areas are close by or available in these parks. With nearby interstate and rail access, we offer an ideal location for development and solid residential areas for families. Salix is part of the Westwood Community School district. Please take the time to look through our website and contact us for more information about the opportunities that are available here. We look forward to seeing you soon!